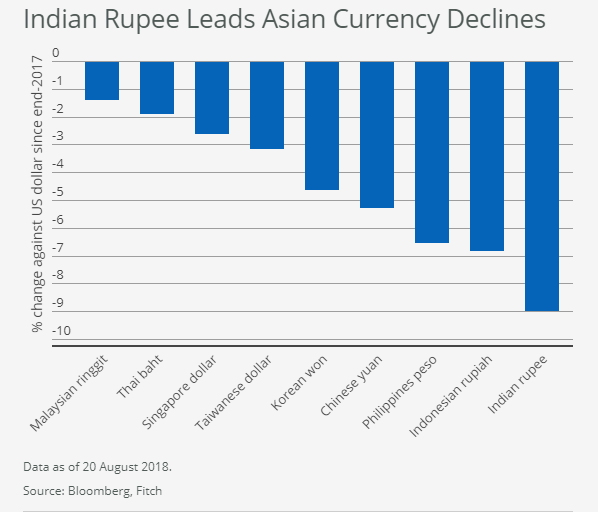 Hong Kong/Singapore/Mumbai: Indian Rupee has depreciated by around 9% against the US dollar since the start of 2018, making it the worst-performing major currency in Asia, according to Fitch. Fitch today released it’s analysis vis-a-vis the performance of Indian Rupee by stating that the widening of the trade deficit in July 2018 to its largest gap since May 2013 also is a contributory factor. For its overall analysis, Fitch has factored the net portfolio outflows through mid-August that have totalled USD5.5 billion for the year, mostly in bonds, compared with inflows of USD27.9 billion over the same period in 2017. The rating agency goes on to point out that foreign direct investment inflows have also weakened and no longer cover the current account deficit – in other words, India’s basic balance has turned negative. The current account deficit has widened as global oil prices have risen, but at 1.9% of GDP in 1Q18, up from 1.6% in 2017, was still well below the 5% of GDP recorded around the time of the 2013 Taper Tantrum. Foreign-exchange reserves have declined by USD24 billion since mid-April 2018, but still cover 7.2 months of current account payments. The most vulnerable companies are likely to be those with significant foreign-currency debt, and which operate in sectors with significant imported/commodity inputs and revenue denominated in local currency – such as the airline, telecom, auto, chemical and fertiliser sectors. 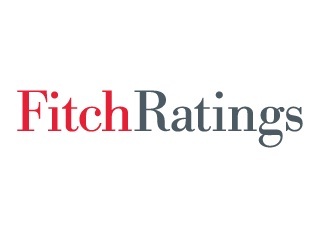 However, most Fitch-rated corporates are unlikely to be significantly affected, as those with foreign-currency debt tend to have a natural hedge from export earnings, as in the case of commodity producers. Domestic-currency lending to corporates with unhedged foreign-currency borrowings could face increased repayment risk. Indian banks are already struggling with asset-quality problems and have thin loss-absorption buffers to cope with further stress. The risk of currency pressures triggering a sudden spike in domestic borrowing costs is mitigated by the RBI’s relatively narrow focus on its inflation objective. But external pressures may be enough to prompt another 25bp hike this year, but dramatic moves by the RBI to defend the currency appear unlikely in Fitch’s view. According to Fitch, India’s vulnerability to currency risk and capital outflows is unlikely to translate into significant pressure on the sovereign credit profile or pose external financing risks. A recent sharp sell-off in the rupee illustrates India’s sensitivity to shifts in market sentiment towards emerging markets, and suggests there could be further bouts of pressure as global monetary tightening progresses, Fitch Ratings says, adding the impact of currency weakness on India’s sovereign credit profile is likely to be limited by relatively strong external finances, especially the low level of external debt.